A few months ago I had a day of Thai massage exchange with my friend C. Apart from exchanging massage it is a treat for me because C loves cooking. 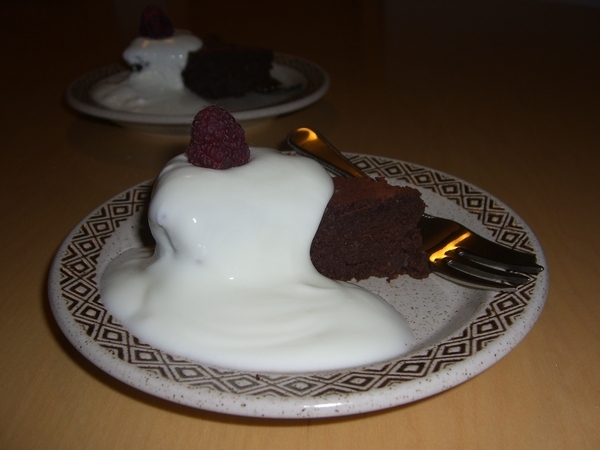 He served me a delicious chocolate torte which was wheat and gluten free and asked me to guess the mystery ingredient. I couldn’t work it out and was amazed when he told me. Last weekend we had guests for lunch and I made the recipe, then on Tuesday I took some slices to the last stained glass class before the summer break. No one could identify what it was made from, but all agreed that it was delicious. Melt the chocolate in a heatproof bowl over a pan of gently simmering water. Remove from the heat, take the bowl carefully off the water and stir until smooth. Leave to cool for 20 mins. If the chocolate is too hot it will make the batter too runny. Preheat the oven to 190C. Grease a 23cm spring-form cake tin and line the bottom with baking parchment. I used a 20cm loose bottomed tin rather than spring-form, I lowered the temperature to 175C for a fan oven and increased the time a little to make up for the extra depth of the cake. Put the icing sugar, butter and chickpeas in a food processor and blend together until smooth. Switch off and scrape down the sides if necessary. I don’t have a food processor so I used a goblet blender and this was a bit of a pain as the mix is not loose enough to churn over. A stick blender might be better. Add the egg yolks in and blend again. Finally pour in the chocolate in a continuous stream with the motor running to get it all combined. In a separate, grease-free bowl, whisk the egg whites until they are stiff but not dry. Fold into the chocolate and chickpea mixture. Spoon the mixture into the tin and spread to the sides. Bake for 35 mins (or more in my case) until the cake has risen, is firm to the touch and has started to shrink from the sides of the tin. I tested it will a skewer, which came out moist, but not gooey. Leave to cool for 15 mins or so in the tin before turning out. I chose to put it on the plate upside down as that was the smoother surface. Dust the whole thing by sifting the cocoa powder through a sieve over it. The original recipe suggested serving with a rum cream made by dissolving 3 tbs soft dark brown sugar in 3 tbs dark rum and whisking into 400ml double cream until it forms soft peaks. You could do that, but we found it perfect with a dollop of natural yoghurt instead. Looking forward to trying this recipe as it tasted lovely. Good luck. Do let me know if you have success in adapting it for use with raw cacao and agave syrup. I have several friends who would be interested in that.